If you take a closer look at Pakistan's botched up run-chase of Bangladesh's 239, you could perhaps jot down myriad turning points. Like the start provided by Mehidy Hasan, for instance, piling on pressure on an already struggling Fakhar Zaman and bringing an end to his miserable Asia Cup 2018 on the sixth ball. Like the fabulously controlled length delivery from Mustafizur Rahman, that pitched right on the seam and straightened to get Pakistan's best batsman, Babar Azam, for just 1. Or Sarfraz Ahmed's wild waft away from the body that gave Bangladesh an identical start with the ball to Pakistan's by the fourth over. There was even Mashrafe Mortaza's fantastic dive to his left at short midwicket to puncture a gaping hole through Pakistan's chase with the dismissal of Shoiab Malik. And what about Asif Ali's soft dismissal against Mehidy in the 40th over after a measured 71-run stand with Imam Ul Haq that kept Pakistan alive? 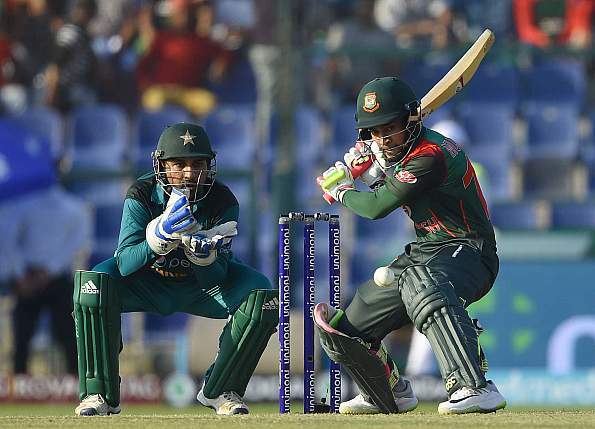 Each of these moments from the second-half of the virtual semifinal in Abu Dhabi had the potential to be the game-changer, but the epicenter of Bangladesh's excellent comeback lay elsewhere. Precisely, bang in the middle of the first innings, thanks to Mushfiqur Rahim. In the fifth over on the hot afternoon, the local broadcasters turned their cameras towards a reserves bib-wearing Mohammad Amir, sitting by himself beyond the fence. It's hard on him, after the sort of start his replacement - Junaid Khan - was having, but he maintains a straight face.